Enjoy Utah! : WIN A VIP Meet and Greet With Disney Characters! WIN A VIP Meet and Greet With Disney Characters! You've entered to win Disney On Ice tickets.... now you can enter to win a meet and greet with some Disney characters on opening night! If you are selected as our random winner, you will be able to come early on opening night of Disney On Ice Let's Celebrate, and mingle with some Disney characters at the meet and greet! 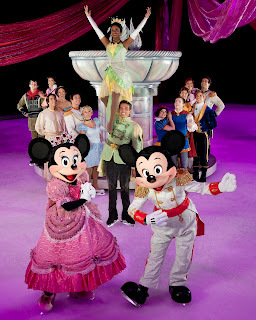 We attended the meet and greet last November when Disney On Ice was in town, and it was a blast! This Monday, January 24th, I will be downtown at the Energy Solutions Arena plaza, door six, from 6am to 9am for the Food Drive. Enjoy Utah will be hanging out live on TV with Big Budah from Fox 13 from 7am to 8am, so IF you are at home, make sure you are watching! When you come down to the Energy Solutions Arena Monday morning (between 6am and 9am), find the Enjoy Utah! booth and bring us 10 cans of food! Not only will you get a free pass for opening night of Disney On Ice Let's Celebrate, you will also be able to enter to win the meet and greet! Make sure you come to the Enjoy Utah! booth! Good luck, and we will see you on Monday! There will be a few of us from Enjoy Utah! there, so if you are able, stay awhile and hang out with us! Just make sure you dress super warm, as we will be outside! We always enjoy meeting our readers and getting to know them!